Before playing the movie, have you tried selecting the alternate track? both (dts and dtshd) were checked. [ 0.015][v][ytdl_hook] lua-settings/ytdl_hook.conf not found. [ 0.015][v][cplayer] Done loading @ytdl_hook.lua. [ 0.016][v][ipc] Listening to IPC pipe. [ 0.018][v][cplayer] Done loading C:/Users/htpch/AppData/Roaming/Emby-Theater/system/x64/mpv/scripts/refreshrate.lua. [ 0.021][v][file] Stream opened successfully. [ 0.022][v][demux] Trying demuxers for level=normal. [ 0.024][v][mkv] Seeking to 250029342 to read header element 0x1c53bb6b. [ 0.024][v][cache] Dropping cache at pos 250029342, cached range: 0-2162688. [ 0.024][v][mkv] Seeking to 250030354 to read header element 0x1254c367. [ 0.024][v][cache] Dropping cache at pos 2741, cached range: 250029342-250031580. [ 0.024][v][mkv] All headers are parsed! [ 0.055][v][vo/opengl] Trying to create GLES 3.x context. [ 0.104][v][vo/opengl] Detected GLES 3.0. [ 0.104][v][vo/opengl] Loaded extension GL_EXT_texture_norm16. [ 0.104][v][vo/opengl] Loaded extension GL_EXT_color_buffer_half_float. [ 0.104][v][vo/opengl] Loaded extension GL_EXT_disjoint_timer_query. [ 0.105][v][vo/opengl] Loaded extension GL_ANGLE_translated_shader_source. [ 0.106][v][vo/opengl] Using FBO format rgba16. [ 0.106][v][vo/opengl] No advanced processing required. Enabling dumb mode. [ 0.107][v][vo/opengl] Assuming 24.000000 FPS for display sync. [ 0.109][v][vd] Using software decoding. [ 0.109][v][vd] Detected 4 logical cores. [ 0.109][v][vd] Requesting 5 threads for decoding. [ 0.126][v][ao/wasapi] No device specified. Selecting default. [ 0.143][v][ao/wasapi] Retrying as AC3. [ 0.144][v][cplayer] Falling back to PCM output. [ 0.144][v][ad] Uninit audio decoder. [ 0.144][v][ad] Requesting 1 threads for decoding. [ 0.146][v][ao/wasapi] No device specified. Selecting default. [ 0.162][v][ao/wasapi] IAudioClock::GetFrequency gave a frequency of 384000. [ 0.165][v][ao/wasapi] device buffer: 2400 samples. [ 0.165][v][ao/wasapi] using soft-buffer of 9600 samples. [ 0.203][v][vd] Using container aspect ratio. [ 0.206][v][vo/opengl] Using FBO format rgba16. [ 0.206][v][vo/opengl] No advanced processing required. Enabling dumb mode. [ 60.099][v][ad] Uninit audio decoder. [   0.143][v][ao/wasapi] Retrying as AC3. [   0.144][v][cplayer] Falling back to PCM output. Edited by Doofus, 03 December 2017 - 03:43 PM. @Luke, I just tested the audio selection before playback, it isn't working. You can only select audio using the overlay while playing. [ 0.017][v][ytdl_hook] lua-settings/ytdl_hook.conf not found. [ 0.017][v][cplayer] Done loading @ytdl_hook.lua. [ 0.018][v][ipc] Listening to IPC pipe. [ 0.020][v][cplayer] Done loading C:/Users/htpch/AppData/Roaming/Emby-Theater/system/x64/mpv/scripts/refreshrate.lua. [ 0.025][v][file] Stream opened successfully. [ 0.025][v][demux] Trying demuxers for level=normal. [ 0.029][v][mkv] Seeking to 250029342 to read header element 0x1c53bb6b. [ 0.029][v][cache] Dropping cache at pos 250029342, cached range: 0-1769472. [ 0.029][v][mkv] Seeking to 250030354 to read header element 0x1254c367. [ 0.030][v][cache] Dropping cache at pos 2741, cached range: 250029342-250031580. [ 0.030][v][mkv] All headers are parsed! [ 0.059][v][vo/opengl] Trying to create GLES 3.x context. [ 0.105][v][vo/opengl] Detected GLES 3.0. [ 0.106][v][vo/opengl] Loaded extension GL_EXT_texture_norm16. [ 0.106][v][vo/opengl] Loaded extension GL_EXT_color_buffer_half_float. [ 0.106][v][vo/opengl] Loaded extension GL_EXT_disjoint_timer_query. [ 0.106][v][vo/opengl] Loaded extension GL_ANGLE_translated_shader_source. [ 0.107][v][vo/opengl] Using FBO format rgba16. [ 0.107][v][vo/opengl] No advanced processing required. Enabling dumb mode. [ 0.109][v][vo/opengl] Assuming 24.000000 FPS for display sync. [ 0.110][v][vd] Using software decoding. [ 0.110][v][vd] Detected 4 logical cores. [ 0.110][v][vd] Requesting 5 threads for decoding. [ 0.123][v][ao/wasapi] No device specified. Selecting default. [ 0.141][v][ao/wasapi] Retrying as AC3. [ 0.143][v][cplayer] Falling back to PCM output. [ 0.143][v][ad] Uninit audio decoder. [ 0.143][v][ad] Requesting 1 threads for decoding. [ 0.145][v][ao/wasapi] No device specified. Selecting default. [ 0.163][v][ao/wasapi] IAudioClock::GetFrequency gave a frequency of 384000. [ 0.166][v][ao/wasapi] device buffer: 2400 samples. [ 0.166][v][ao/wasapi] using soft-buffer of 9600 samples. [ 0.202][v][vd] Using container aspect ratio. [ 0.208][v][vo/opengl] Using FBO format rgba16. [ 0.209][v][vo/opengl] No advanced processing required. Enabling dumb mode. 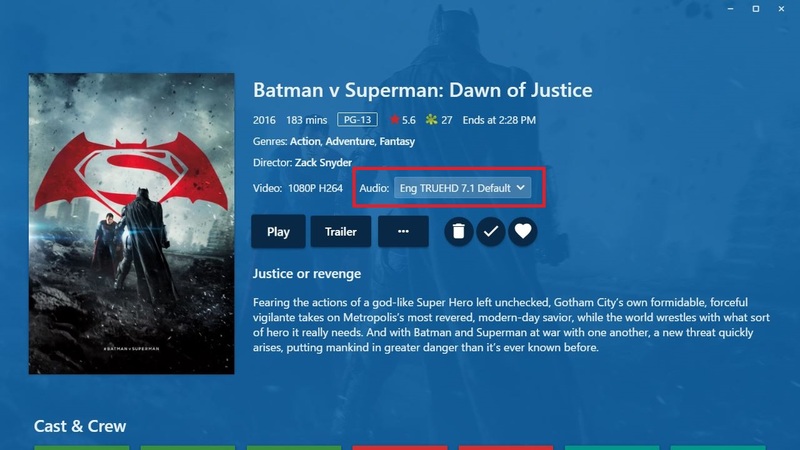 [ 6.295][v][ad] Uninit audio decoder. [ 6.304][v][ao/wasapi] No device specified. Selecting default. [ 6.317][v][ao/wasapi] Retrying as AC3. [ 6.358][v][ao/wasapi] IAudioClock::GetFrequency gave a frequency of 48000. [ 6.359][v][ao/wasapi] device buffer: 480 samples. [ 6.359][v][ao/wasapi] using soft-buffer of 9728 samples. [ 60.096][v][ad] Uninit audio decoder. [ 0.016][v][ytdl_hook] lua-settings/ytdl_hook.conf not found. [ 0.016][v][cplayer] Done loading @ytdl_hook.lua. [ 0.017][v][ipc] Listening to IPC pipe. [ 0.024][v][file] Stream opened successfully. [ 0.024][v][demux] Trying demuxers for level=normal. [ 0.028][v][mkv] Seeking to 250029342 to read header element 0x1c53bb6b. [ 0.028][v][cache] Dropping cache at pos 250029342, cached range: 0-2097152. [ 0.028][v][mkv] Seeking to 250030354 to read header element 0x1254c367. [ 0.029][v][cache] Dropping cache at pos 2741, cached range: 250029342-250031580. [ 0.029][v][mkv] All headers are parsed! [ 0.058][v][vo/opengl] Trying to create GLES 3.x context. [ 0.105][v][vo/opengl] Loaded extension GL_EXT_texture_norm16. [ 0.105][v][vo/opengl] Loaded extension GL_EXT_color_buffer_half_float. [ 0.105][v][vo/opengl] Loaded extension GL_EXT_disjoint_timer_query. [ 0.108][v][vo/opengl] Assuming 24.000000 FPS for display sync. [ 0.142][v][ao/wasapi] Retrying as AC3. [ 0.164][v][ao/wasapi] IAudioClock::GetFrequency gave a frequency of 384000. [ 0.167][v][ao/wasapi] device buffer: 2400 samples. [ 0.167][v][ao/wasapi] using soft-buffer of 9600 samples. [ 0.206][v][vd] Using container aspect ratio. [ 0.211][v][vo/opengl] Using FBO format rgba16. [ 0.211][v][vo/opengl] No advanced processing required. Enabling dumb mode. [ 0.237][v][ad] Uninit audio decoder. [ 0.265][v][ao/wasapi] No device specified. Selecting default. [ 0.281][v][ao/wasapi] Retrying as AC3. [ 0.311][v][ao/wasapi] IAudioClock::GetFrequency gave a frequency of 48000. [ 0.312][v][ao/wasapi] device buffer: 480 samples. [ 0.312][v][ao/wasapi] using soft-buffer of 9728 samples. [ 60.056][v][ad] Uninit audio decoder. [ 0.014][v][ytdl_hook] lua-settings/ytdl_hook.conf not found. [ 0.014][v][cplayer] Done loading @ytdl_hook.lua. [ 0.015][v][ipc] Listening to IPC pipe. [ 0.017][v][cplayer] Done loading C:/Users/htpch/AppData/Roaming/Emby-Theater/system/x64/mpv/scripts/refreshrate.lua. [ 0.025][v][mkv] Seeking to 250029342 to read header element 0x1c53bb6b. [ 0.025][v][cache] Dropping cache at pos 250029342, cached range: 0-2097152. [ 0.025][v][mkv] Seeking to 250030354 to read header element 0x1254c367. [ 0.026][v][cache] Dropping cache at pos 2741, cached range: 250029342-250031580. [ 0.026][v][mkv] All headers are parsed! [ 0.056][v][vo/opengl] Trying to create GLES 3.x context. [ 0.099][v][vo/opengl] Detected GLES 3.0. [ 0.099][v][vo/opengl] Loaded extension GL_EXT_texture_norm16. [ 0.099][v][vo/opengl] Loaded extension GL_EXT_color_buffer_half_float. [ 0.099][v][vo/opengl] Loaded extension GL_EXT_disjoint_timer_query. [ 0.100][v][vo/opengl] Loaded extension GL_ANGLE_translated_shader_source. [ 0.101][v][vo/opengl] Using FBO format rgba16. [ 0.101][v][vo/opengl] No advanced processing required. Enabling dumb mode. [ 0.102][v][vo/opengl] Assuming 24.000000 FPS for display sync. [ 0.103][v][vd] Using software decoding. [ 0.103][v][vd] Detected 4 logical cores. [ 0.103][v][vd] Requesting 5 threads for decoding. [ 0.117][v][ao/wasapi] No device specified. Selecting default. [ 0.135][v][ao/wasapi] Retrying as AC3. [ 0.157][v][ao/wasapi] IAudioClock::GetFrequency gave a frequency of 48000. [ 0.160][v][ao/wasapi] device buffer: 480 samples. [ 0.160][v][ao/wasapi] using soft-buffer of 9728 samples. [ 0.205][v][vd] Using container aspect ratio. [ 0.209][v][vo/opengl] Using FBO format rgba16. [ 0.238][v][ad] Uninit audio decoder. [ 0.260][v][ao/wasapi] No device specified. Selecting default. [ 0.279][v][ao/wasapi] Retrying as AC3. [ 0.287][v][ao/wasapi] IAudioClock::GetFrequency gave a frequency of 48000. [ 0.287][v][ao/wasapi] device buffer: 480 samples. [ 0.287][v][ao/wasapi] using soft-buffer of 9728 samples. [ 60.050][v][ad] Uninit audio decoder. Edited by ohhofer, 03 December 2017 - 03:58 PM. [   0.142][v][ao/wasapi] Retrying as AC3. Interesting! 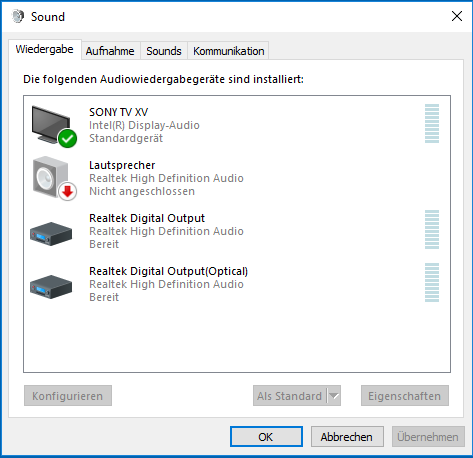 Can you tell me all the windows audio devices that are listed in your audio playback devices, perhaps a screenshot? Well, that looks fine. I was hoping it would list another device. Let's rule some things, out. Can you connect your optical directly from the computer to the AVR, and select that as the default player? I already tried this yesterday. But it did not make a difference. I can try it again tomorrow as I have to leave now. Edited by Doofus, 03 December 2017 - 07:29 PM. I have a feeling that your TV just can't deal with DTS. 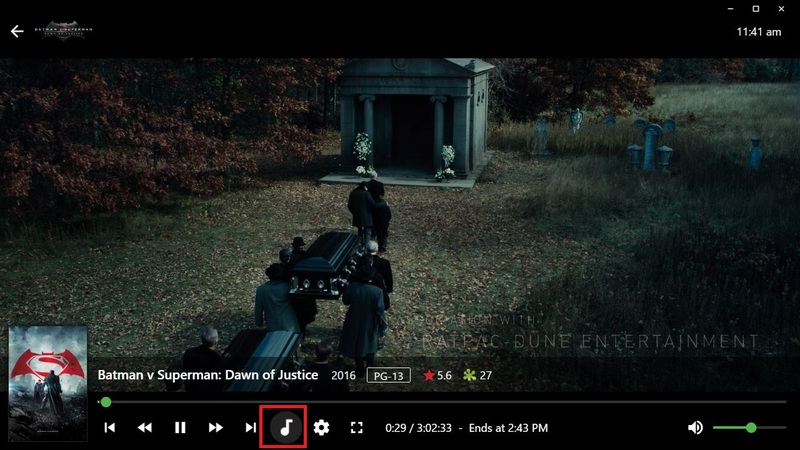 With the fire stick, the server is probably transcoding the audio to AC3 (Dolby), and it plays. ... when playing via emby theater the display of the receiver says "dolby pro logic II" and the two rear speakers are not approached seperately. MPV doesn't convert to AC3 (Dolby) automatically, but can be made to. I suspect that in your case, we may need to do that. Looking at your stats for nerds, the movie is direct playing. This means the server is not doing anything with the stream. As mpv can support everything, the server is not getting involved, not knowing that your AV equipment can't handle it. If I'm correct, replace everything in the mpv.conf (portable_config/mpv.conf) with this. If that works, we can then apply it to Theater. This will convert any audio with 5 channels or more, to AC3. Except what is already AC3, and that will be bitstreamed without change. Edited by Doofus, 29 November 2018 - 10:39 PM. I tried it as described above and it worked!!! You found the real cause of the problem. Remove the audio-spdif line, and select only AC3 in the Theater audio settings. And you should be good. Thank you. I'll try it in the evening when I am back from work. I copied the adapted mpv.conf file to the suggested folder and it works works very well! @Doofus Thank you VERY MUCH for your help.